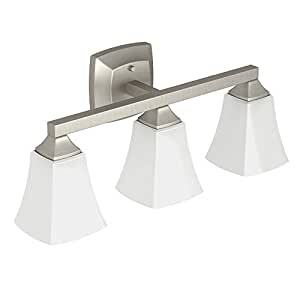 Add elegance and style to your bathroom with Moen Voss Bath Lighting. These flared, rectangular glass globes can be mounted up or down according to your preference. Choose from two, three, or four globes for the perfect amount of light for your room. The light fixture supports up to 100-watt bulbs and is available in chrome, brushed nickel, and oil-rubbed bronze finishes. Quick-connect wiring and glazed sockets makes installation quick and easy. Love the modern and polished look of this light. I purchased the faucet and toilet paper holder from this line as well and they all compliment each other well. I’m using it in a small powder room as the only source of light and it provides plenty of light for the room. I have attached a photo showing it turned on with soft white LED bulbs in it. Easy to install and change bulbs when needed. After buying and installing my first one, we loved it so much we ended up buying a second. Easy install and great instructions. Even includes a special tool for locking in the glass bulb housings. Beautiful design and true to the advertised picture. High quality item, looks excellent in place. Improvements to make installation easier actually make installation easier. Delivered on time as promised. I’m confident recommending this product to others. Nice unit. Mounted easily. Is attractive. Gives off good light using LED bulbs. These almost match my faucet style which was discontinued (Olmsted). Easy to install, and looks nice. The light bar is as described and looks great. These lights match the other pieces of the collection that we have. They are very stylish and look great. Love them.